Snow Valley Aerial Park charges into 2019 with new offers and easy to understand pricing. This season we’re introducing something called the “EXTRA Value Card”! This season we’re introducing the EXTRA Value Card! A transferable ‘Frequent Adventurer’ card that will save you as much as $120 off the walk up price. Share it with friends or family from Opening Weekend (May 18) until closing at the end of September. 2019 will open to the general public beginning May 18. Beginning June 28th, we will open Monday to Sunday: 9:00 am to 9:00 pm. All access is for 3 hours including Ground School. If your child is between 100 cm and 125 cm tall, they will only get access to the 24 challenges of the Kid’s Course (ground level) for as little as $24 plus tax. A Kid’s Course Chaperone, a responsible person 14 years or older, is complimentary. If your Adventurer is under 140 cm, yet OVER 125 cm, they may get access to the ENTIRE tower also for as little as $24 plus tax. A Chaperone with paid access is required and they must be over 140 cm and at least 14 years of age. 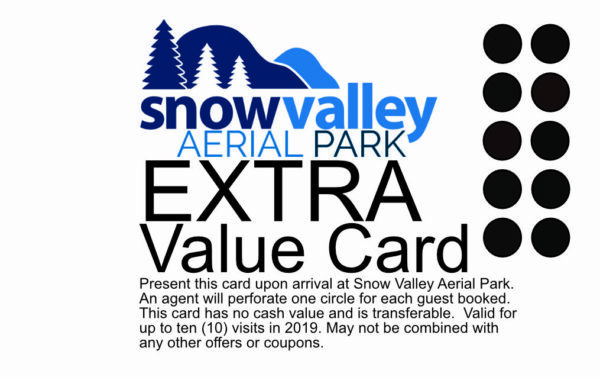 Finally, if you’re over 140 cm, no matter your age or ability (yet able to meet the minimum physical requirements), you may challenge Snow Valley Aerial Park for just $37 plus tax when booking in advance online.